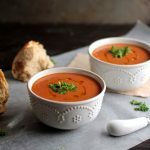 This easy and flavorful vegan roasted red pepper soup recipe is creamy, filling, and simple to make. Perfect for chilly evenings! Vegan, Vegetarian. I’ve been on such a roasted red pepper kick lately! Roasting things in the middle of winter is just so satisfying. You know what else is super satisfying in the middle of winter? SOUP. Especially this soup, because it combines my wintery love of roasting things with my wintery love of soup-eating. 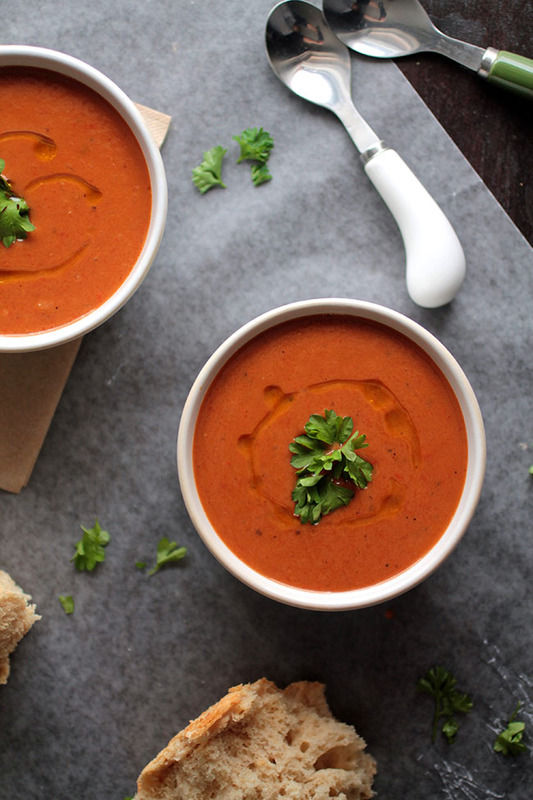 One of the best things about this soup, though, is that it’s VEGAN! I know I’ve been neglecting my vegan friends a bit lately (sorry dudes!) and a lot of you have been asking for more vegan recipes. PS – For the non-vegan types, this soup is SO creamy that you won’t even miss the meat or dairy you might be used to. I love the way the almond milk sweetens up the smoky peppers just a little bit – almond is such a distinctive flavor, and I love using almond milk to lend a bit of depth to quick, simple recipes. This soup really is simple – just a handful of ingredients (you probably have them all in your pantry already!) The most time consuming piece is roasting the red peppers and waiting for them to cool (no burning your fingerprints off, okay?) – but that’s all inactive time, so you can catch up on work (or, *cough*, the latest New Girl episodes) in between the various steps and just spend half an hour or so throwing everything together and immersion blending away when you’re ready to eat! 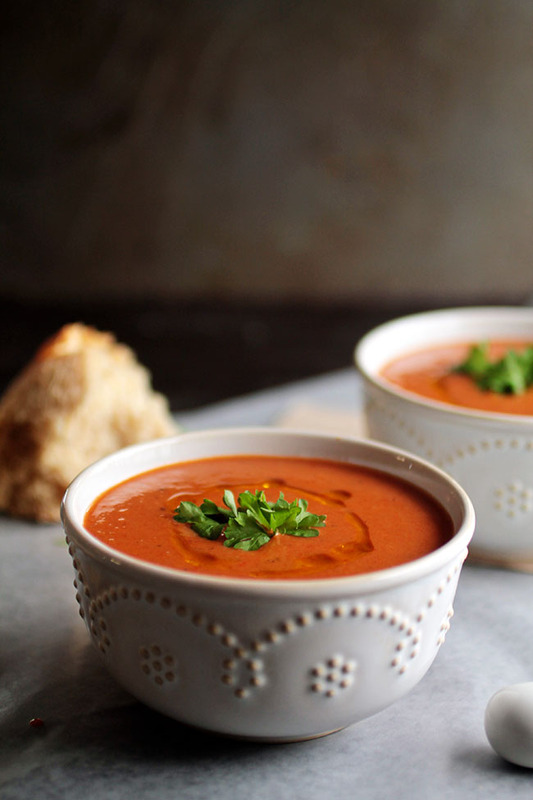 Easy vegan roasted red pepper soup – perfect for chilly weeknights! Roast red bell peppers in a 400 degree F oven for 30-40 minutes until skin is charred and wrinkly. Remove peppers from oven, place in a bowl, and cover with plastic wrap. Let sit until peppers are cool enough to handle, about 30 minutes, then remove the stem and seeds and peel off the skin. The steam released from the hot peppers when covered with plastic should help the skin come off fairly easily. When roasted peppers are peeled and de-seeded, give them a rough chop and set aside. Heat olive oil in a medium pot or saucepan over medium heat. When oil is shimmering, add onion and garlic and sauté, stirring occasionally, until onion is translucent, about 5 minutes. Add flour and stir to let the flour soak up as much liquid as possible. Cook for 1 minute more. Add balsamic vinegar and stir to combine. Add vegetable stock a little at a time, stirring constantly to break up any clumps of flour. Add roasted red peppers to the stock and bring soup to a simmer. Remove soup from heat and add almond milk. 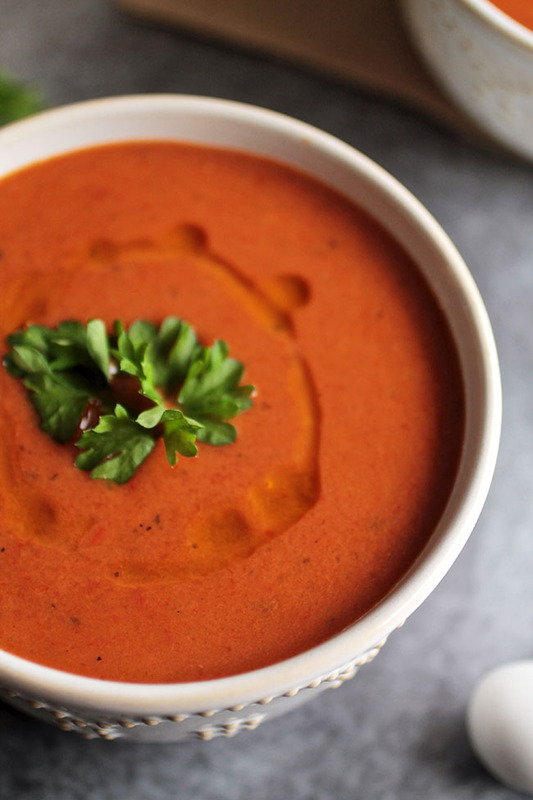 Use an immersion blender to blend the soup until smooth. (If you don’t have an immersion blender, transfer soup to a regular blender in batches). Taste soup and add seasoning as necessary. Ladle soup into bowls and top with a small drizzle of olive oil and a sprig of parsley. Serve immediately. Need an immersion blender? 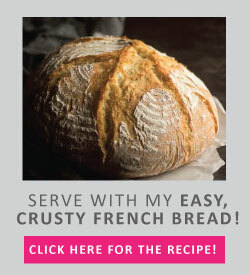 I love this one by Cuisinart. Don’t forget to check out 10 Ways to Use Your Immersion Blender for more great hand blender tips! Thanks for the lovely recipe. 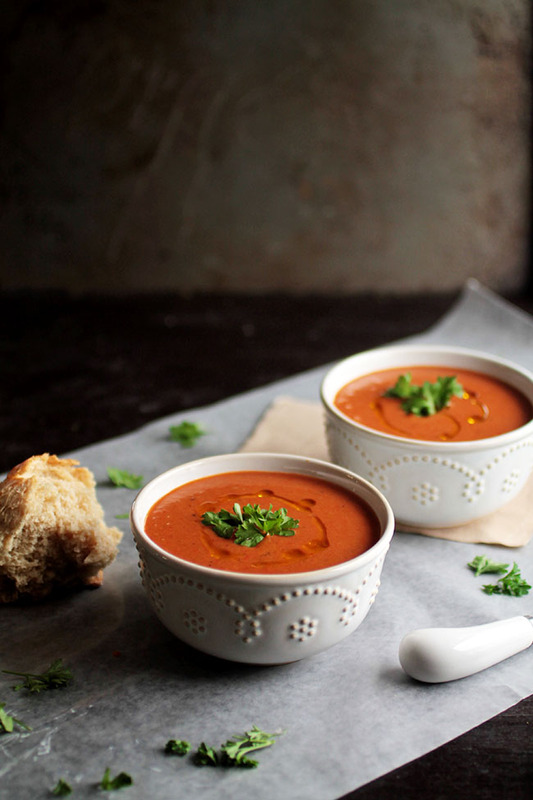 Red pepper soup. It’s confusing with the measurements though. You use tbsp and cups. Phenomenal flavor even though I had only three peppers! Because I am WFPB, I omitted the oil and mixed the flour into the broth before adding to the pot. I highly recommend floating a thin slice of lemon on top for garnish. I’ll be doubling this recipe next time. Loved this recipe! But better than that, my kids loved this! I actually only had 3 red peppers, one orange and one yellow. But it was still awesome! And the smell of the peppers roasting was my favorite. I also substituted the flour for cornstarch dissolved in hot water (as we have a gluten free household) and added some oregano and fresh basil at the end. I will definitely make this again. Thank you! Hi Tanja, we love hearing that it was a hit! Woohoo! Delicious! I added a tsp of dried origanum when frying the onions and garlic, plus about 8 pieces of sundried tomato. I didn’t find the need to use the flour though, so I left that out. I also subbed the almond milk for unsweetened soy milk. This is one of my new favourite recipes. I love the balsamic vinegar in it. Hi Kaylyn! Fantastic! Thanks for posting!